Get the gang together for a fun, outdoor adventure at Kolad and enjoy a thrilling session of river rafting over the Kundalika River. Together with your friends, you'll wear life jackets and safety helmets, hop into large inflatable rafts and go rafting down a 2-hr stretch on the Kundalika River. Back at the campsite, you can visit the Sutarwadi Reservoir near the campsite, dip your feet in the water and have fun by the lakeside. In the evening, you'll also enjoy a bonfire at the campsite and spend a merry night under the dark sky. Please note that a minimum of 4 travellers are required to book this Kolad rafting trip. Kolad, a popular getaway destination for travellers from Mumbai and Pune, is a small village on the banks of the Kundalika River, known for excellent adventures in river rafting. The monsoon rain water, pouring over the surrounding Sahyadri hills, pools together into a reservoir at the nearby Bhira Dam. Every morning, water from the dam is released into the Kundalika River, giving rise to thrilling rapids with twists and turns. At the campsite, located on the banks of the Sutarwadi Reservoir, you'll be staying in large and spacious tents that can accommodate 8-10 travellers. 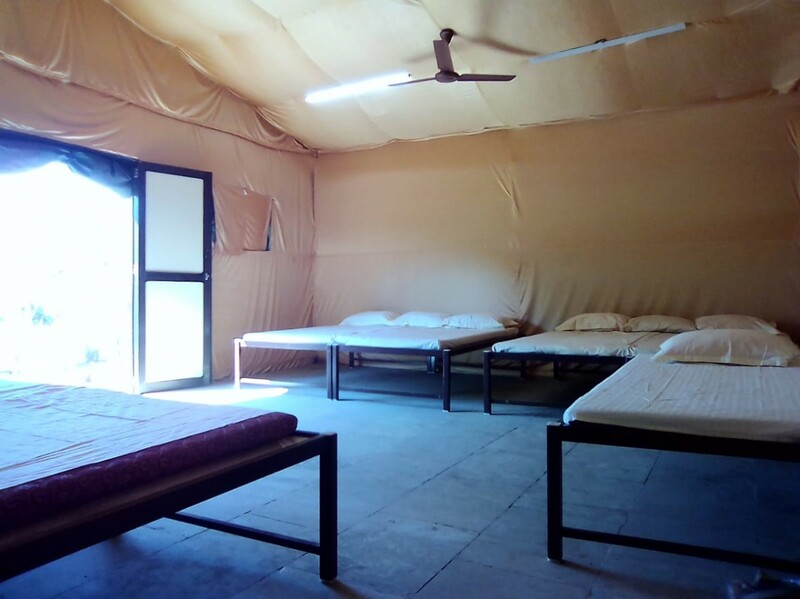 These tents come with comfortable beds with pillows and blankets, and an attached washroom. This package also includes delicious, buffet meals served at the common dining area. • Go rafting in Kolad over rapids of the Kundalika River. • Escape from the city for a night at a beautiful campsite. • Enjoy a bonfire night with your family or friends. • Get lakeside views of the Sutarwadi Reservoir. Children younger than 14 years of age are strictly not allowed for rafting activity. Please make sure you're on time for the Kolad rafting activity. Delays in arriving at the start point can lead to missing the rafting activity. Travellers are required to adhere to instructions of the rafting instructor while rafting in Kolad. For cancellations made 2 days or more before the check-in for this Kolad rafting trip: 75% refund. For cancellations made less than 2 days before the check-in for this Kolad rafting trip: no refund. Rafting in Kolad is a water-dependent activity. The operator will not be held responsible for any last minute cancellation of rafting in Kolad due to inadequate water conditions. You will not be allowed to take part in the Kolad rafting activity if you appear intoxicated or unwell. There will be no refunds in this case. Kids younger than 5 years of age stay for free. Kids between the ages of 5-10 years will be charged at a discount of 50% of full price. Kids older than 10 years will be charged full price. Food from outside the campsite is not allowed. The kitchen at the campsite is well-equipped to serve simple, delicious and filling meals. Day 1 of Kolad rafting trip: Check-in and enjoy! You can check in any time after 14:00 hrs. Check-in to your tents and take a stroll to explore the campsite. After some evening tea, you can visit the Sutarwadi reservoir near the campsite, dip your feet in the water and have fun by the lakeside. In the evening, you'll enjoy bonfire at the campsite and spend the evening with your group of friends or family. After a delicious dinner at night, retreat in your tents for the night. Overnight in tents at Kolad campsite. Spend some time by the Sutarwadi Reservoir by the campsite. Rise and shine early in the morning. Today, after having breakfast at the campsite, you'll immediately head out to the rafting start point. Here, you'll don life jackets and helmets, hop into inflatable rafts for a thrilling 2-hr adventure of river rafting on the Kundalika River. From the rafting end point, you'll return to the campsite for lunch and check-out. Your Kolad rafting trip ends here. Go river rafting over the Kundalika River. All rafting equipment required: rafts, paddles, helmets, jackets, etc. 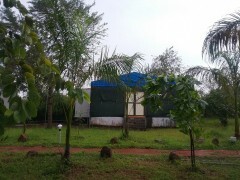 Overnight in tents at Kolad campsite. You can check in by 14:00 hrs. The tents have an attached washroom and beds with pillows and blankets. Today's meal package includes dinner and evening tea only. Inside view of spacious, large tents. Your trip ends by 14:00 hrs. Today's meal package includes breakfast and lunch only. It's time to check out after lunch. Your Kolad rafting trip ends here.